Simply put, you have to watch lots of things when you ring. We’re talking about the music, the bells, and your fellow ringers. Oh yeah… the director too… and the audience (or congregation, depending on where you’re playing). And you have to keep track of all of them simultaneously, and with as much consistency as possible. It’s all about “line of sight.” If it’s not in your direct view, you can’t watch it. Conversely, the more things you have to watch, the more of them you have to put in your line of sight. Since the director is the one who is farthest away, you ideally should line everything else up as closely as possible to the line from where you are to where he or she is. “Closely as possible” is the operative idea, because you often can’t make it a perfect alignment. But you can take advantage of muscle memory and sense of touch, because your bells can be separated by space (this is even truer if you’re a bass ringer). Other equipment, such as mallets, just have to be put where you can find them when you need them. That leaves your music, unless you’re performing by memory. Just simply move your folder to the line of sight! If you share music with another ringer, negotiate where the best location is. And if all else fails, you can always cheat for a little while by reading off the next binder. You deserve to make your expression of the ringing art as excellent as it can be. Working with the line of sight effectively will make this easier for you and will allow you to concentrate on presenting the music the way it should be presented. Larry Sue is Low Ding Zone’s conceptual founder and artistic figurehead, and also composes and arranges much of the LDZ repertoire. (Someone has to—nothing for a bass handbell ensemble existed beforehand!) Larry has been ringing since 1987. He also has rung with the Valley Ringers of Cupertino, California and Bay Bells. He directs the bell choirs at Saint Andrew’s Episcopal Church (Saratoga, California) and Los Altos United Methodist Church (Los Altos, California). Besides handbells, he plays piano, guitar, bass guitar, clarinet, and bowed psaltery; sings bass, tenor, alto, and offends sopranos with his falsetto; teaches piano and voice; and tunes pianos. He is a published handbell composer, and is the owner, composer, and webmaster for ChoraegusShareMusic, his music company. He also is the author of the Bass Ringer’s Notebook. 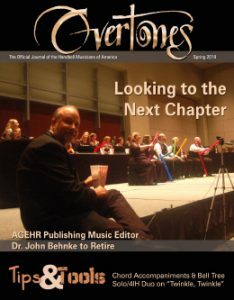 Do YOU have a story to share about your handbell and handchime ringing experiences? Do you know a RINGER with a great anecdote? If you answered yes to either or both of these questions then we want to hear from you! 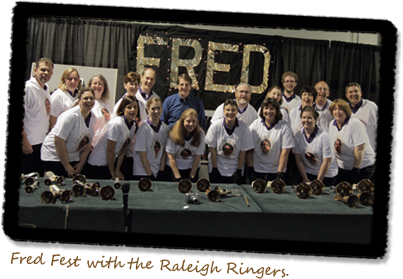 How did you first become involved in the handbell community? Growing up in Central Pennsylvania, I belonged to a church that purchased a set of handbells while I was in Junior High School. The youth of the church were incredibly energized with this new instrument and couldn’t wait to begin making music. We had an incredibly dedicated music director, Russell Gillam, who worked diligently to find us music that would keep us challenged. We were hooked! The bug never left, as I rang in a church while at college, and upon graduation, found a church with handbells in Raleigh, North Carolina. After two years of ringing, my arm was twisted to direct the group. Several years later, a few members from that church group and others from the community participated in the first auditions for “The Raleigh Ringers.” And nearly 22 years later, we’re still kickin’! 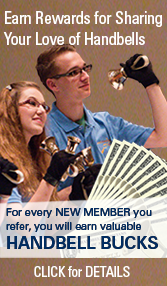 Do you have an anecdote or funny story from your experiences with the handbell community? Back in November, The Raleigh Ringers hosted the 22nd annual Capital Area Handbell Festival. The highlight of the event was the return of our dear friend Fred Gramann from Paris, who led the massed ringing for the weekend. As part of the festival schedule, The Raleigh Ringers present a mini-concert for the 500+ participants. 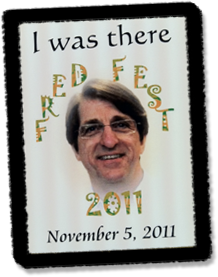 During the festivities, The Raleigh Ringers changed into very tacky Fred Fest 2011 t-shirts with Fred’s picture prominently featured; unveiled very large, lighted “FRED” letters behind the group; and handed out souvenir Fred Fest 2011 cards to all in attendance (which weren’t valid unless they were autographed by Fred Gramann). Needless to say, we weren’t very subtle about the whole thing (which Fred sort of enjoyed, we think!). David M. Harris has been the director of The Raleigh Ringers since January 1990, when he was instrumental in the formation of the group. David studied music while earning a degree in computer science at the Pennsylvania State University and has studied conducting privately with Dr. William A. Payn of Bucknell University. 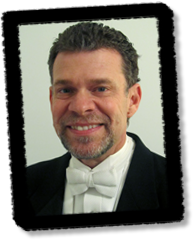 David was previously director of the handbell program at Hudson Memorial Presbyterian Church, and has served the American Guild of English Handbell Ringers (AGEHR) as North Carolina State Chairman and as Area III Treasurer. 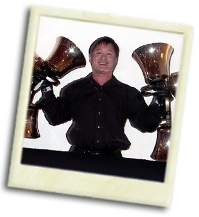 He chaired the national committee that planned the very first Community/ Professional Handbell Choir event, Pinnacle 2000, which was held in Las Vegas, Nevada. David is in increasing demand as a clinician and guest conductor, and has led several national AGEHR events as well as serving as the primary handbell clinician for denominational music events such as Montreat, Lake Junaluska and Lutheridge. After growing up in the Northeast, David moved to Raleigh with his wife, Kristina. Dave and Kris have three children: Daniel, Kate, and Jennifer.